For a while now, I've quietly followed the repeated claims that the Walmart corporation has attained such extraordinary success because its leaders belong to a politically powerful network of Freemasons and/or Satanists. I scoffed at these claims -- at first. But the most recent piece of evidence -- a map displaying Walmarts erected across the landscape in the shape of a massive pentagram -- has forced me to reconsider my skepticism. Proof that Wal-mart is involved in satanism! Let's start out with Wal-Mart's origins. Now, I don't know a whole lot about Sam Walton, but my small amount of research suggests to me that he's either some sort of Satanist, or he's the Devil himself. Sam Walton is the creator of Wal-Mart, but it would be better to call him a Shepherd of Human Sacrifice. Wal-Mart takes the principles of Anton LaVey and perverts them to fit the corporate model, offering people the chance to shoot themselves in the foot and then reveling in it. The video embedded above irrefutably demonstrates that a Walmart mechanic placed Satanic symbols beneath a customer's car. Having researched the case closely, I would estimate that as many as ten percent of Walmart's car repair customers may have received such "improvements" in hidden areas of their vehicles. A six-fold "asterisk" device now replaces the five-pointed star. However, closer study reveals that this new logo is one of the most cunning and clever occult glyphs ever devised. In the many various and sundry classes he instructed in his home in the occult, he invariably instructed his multitude of excited students in this major law of Satan. Those who want fame, power, spell-casting abilities, demons at their beck and call, and to recognize the godhead within, as well as to know the past, present, and future, he extolled to his apt students, must consistently, with intensity, practice talking (reverse speech), walking, thinking, and playing phonograph records, backwards. Let us now apply this "law" to the new Walmart logo, in order to decrypt its true meaning. The first oddity I noticed was the choice of font. Since previous Walmart logos had used all upper-case letters, why did the company suddenly decide to go lowercase? Why, in particular, did the designers of the new logo create a font in which the lowercase "a" seems so distinct and unusual? There it is...hidden in plain sight! There may be other occult references hidden within this glyph. Students who seek to study the matter further may want to start here. Perhaps the most intriguing piece of evidence concerns the massive Freemasonic design in the ground, described by Walmarts both under construction and currently existing in the Washington DC area. 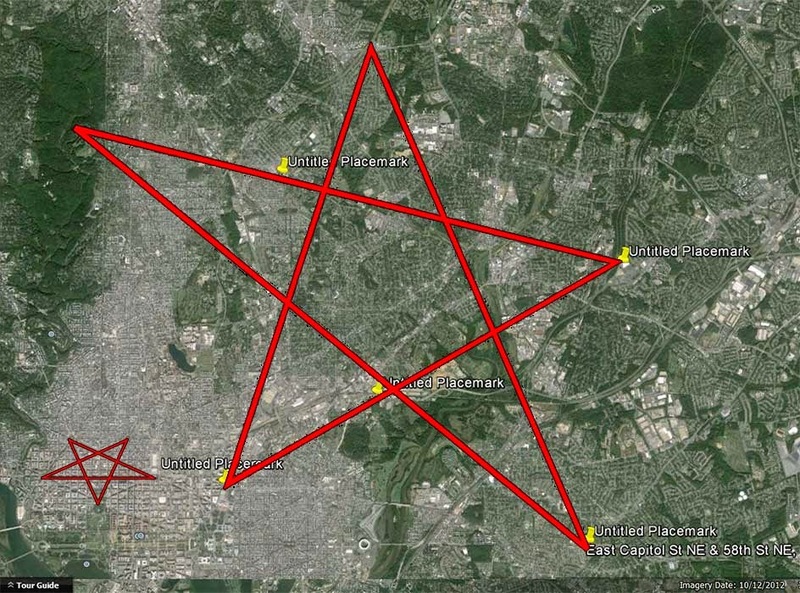 This exact same pentagram -- tilted on its axis 33 degrees -- appears on a larger landscape across the larger DC area. 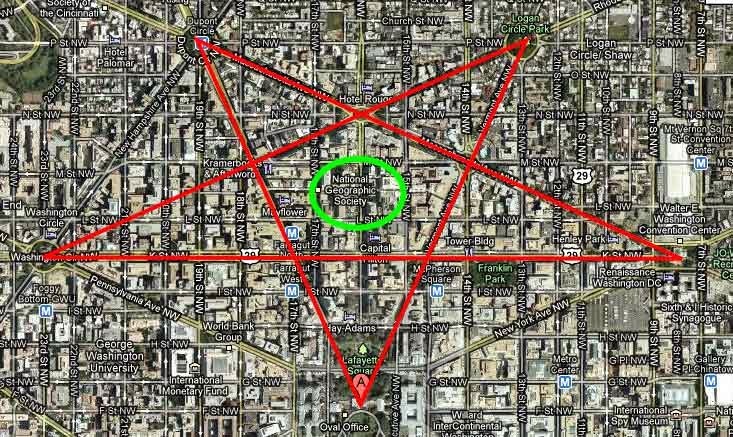 Strangely, the proposed locations of Walmarts now under construction fall directly on this pentagram. Further research indicates that other locations associated with occult practices (not just Walmarts) will fall in line with this five-pointed device. I leave the discovery of those locations to interested students. The "pinpoints" above refer to these new Walmart locations: 99 H Street (very near the Capitol Building, and closest to the "small pentagram" pointing to the White House), New York Avenue and Bladensburg Road, East Capitol and 58th Streets, Fort Totten Square, NE (not marked on this map -- my error! -- but falling directly on the largest line of the pentagram), and an already-extant Walmart at 6210 Annapolis Rd, Landover Hills, MD. The reader may double check these findings for himself. The placement of these new Walmarts is so precise -- and so telling -- as to erase all doubt. I humbly ask readers to do what they can to direct attention to these findings, particularly on websites devoted to Christianity and to conspiracy research. The 'W', 23rd letter of the modern English alphabet, also stands for 'Weishaupt'; and the shape that it forms together with its reflection is the Masonic square and compasses. Managers at Walmart's British wing, ASDA, take part in a ritual involving red hats, which researchers of the occult have yet to explain. HA! Slipped one in before the 2nd. nice. giveaway was your total acceptance of the claims as irrefutable. One of the best April Fool's postings on the Net ... and done in just the right style, too! Joe, you must a have stomach of cast iron to trawl through the enormous piles of CT stuff out there. The only thing worse would be a CIA/NSA/MI6 staffer tasked with writing it. Not only that, Walmart sells lots of Procter & Gamble products. ...and people don't complain even when the line is 15 deep. Could they be deeply "reflecting" internally. Is deeply reflective satanism being pumped in via specialty speakers not made in the USA? I have gone to a Walmart, but that was under emergency duress on behalf of another person. When confronted by a Walmart greeter, Charon on the River Styx always comes to mind. Now I know why. I'll never shop there again. Best April Fools I've seen! LOL! Nice one Mr. C.! I'm a little behind in my review of a lot of material, so I'm late in submitting this post.